In many advice columns and informational resources for caregivers of loved ones with Alzheimer’s disease, you’re likely to find recommendations that suggest unplugging the stove. There’s solid reasoning behind this advice: Some people who suffer from Alzheimer’s disease may begin to cook but lose track of what they’re doing partway through the process. When the stove is forgotten, the results can be disastrous. So while there’s a valid safety reason behind preventing loved ones with Alzheimer’s disease from inadvertently putting themselves in harm’s way by cooking alone, there are an abundance of valid reasons why cooking can be a beneficial activity for people who have Alzheimer’s disease – all the better when it means spending quality time with someone they care about. We’ve put together this comprehensive guide encompassing the cognitive, emotional, and other health-related benefits of cooking for people with Alzheimer’s disease, how to create a safe environment for cooking and baking, ways caregivers can assist to make the activity enjoyable, and addressing eating challenges that may arise among individuals suffering from Alzheimer’s disease. The following resources offer information on the cognitive and other health benefits of cooking with Alzheimer’s and the positive effects of being able to continue participating in activities that were once enjoyable. Music and cooking are both noted as positive activities that can help with behavior problems for people with Alzheimer’s disease or dementia. As a bonus, these activities often offer stress-relieving benefits for caregivers, as well. This resource describes the results of a study, which found that two one-hour sessions weekly over a four week period resulted in improvements in patients’ average behavioral scores and in caregivers’ average distress scores. Washing up, cooking, and cleaning are activities that can actually reduce the risk of Alzheimer’s disease, even in individuals who are over 80. This article from the U.K.’s Daily Mail reveals the findings of research that show the benefits of moderate, everyday activities such as cooking and cleaning in potentially warding off Alzheimer’s disease. Even in the early, mild stage of Alzheimer’s disease, sufferers may lose interest in activities that they once enjoyed, such as cooking. Finding ways to make these once-enjoyable activities more pleasurable and functional for a person with Alzheimer’s disease can help them to maintain their sense of self and purpose. By remaining active and continuing to do the things they once enjoyed, people with Alzheimer’s disease are often able to maintain their skills and independence longer. This resource from the Alzheimer’s Society outlines the many benefits of staying active and involved for people with Alzheimer’s disease. 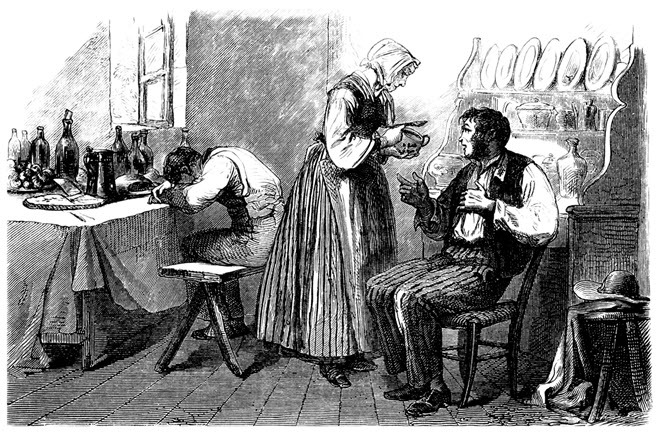 Cooking is among the Instrumental Activities of Daily Living (IADLs). Caregivers typically have to play an increasingly larger role in aiding with these activities as Alzheimer’s disease progresses. This resource offers a helpful explanation of how the caregiver’s role may evolve over time and how to allow a person with Alzheimer’s disease to maintain as much independence as possible. The Montessori Method is one method that’s gaining ground as a means for working with Alzheimer’s sufferers. 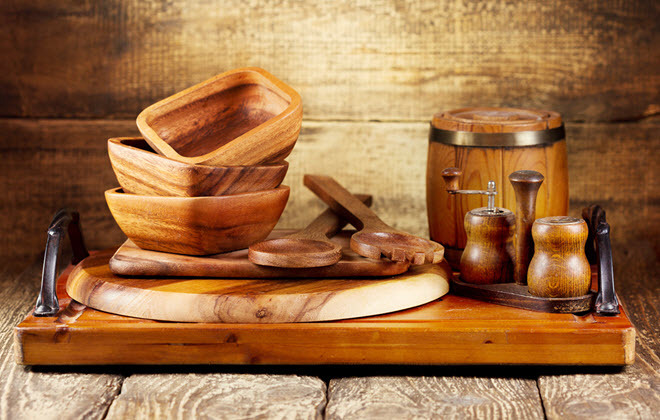 As the Montessori Method involves engaging individuals through the five senses, cooking is one activity that fits into this methodology and helps Alzheimer’s sufferers to connect with the world around them. The following resources provide information on the emotional benefits of cooking with Alzheimer’s, such as facilitating positive personal interactions, the ability for familiar routines to stir memories, and the ability to maintain a sense of self-worth and independence. Continuing to participate in activities and hobbies they once enjoyed is important for people with Alzheimer’s disease. 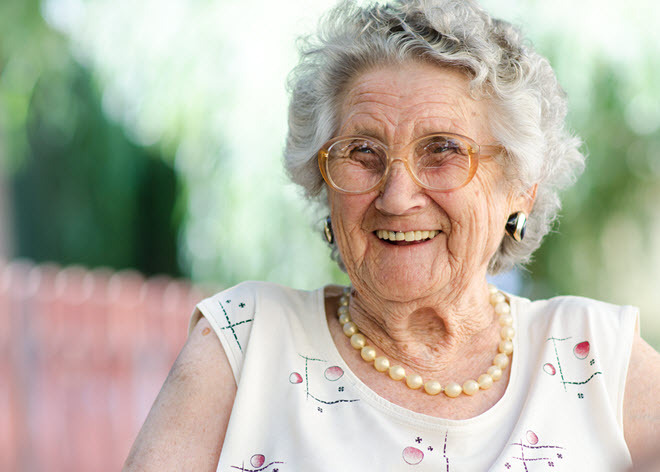 These activities can stir memories, help to build or strengthen emotional bonds and connections with others, help them to feel more engaged with life, and even reduce feelings of stress and anxiety or irritability, that Alzheimer’s disease often brings. Many activities for people with Alzheimer’s disease are designed to help maintain a person’s abilities, dignity, and self-worth. This resource offers guidance for planning activities that can help caregivers understand how to incorporate meaningful activities that will help to achieve these goals. Therapeutic cooking activities can reduce passivity and agitation among people with Alzheimer’s disease or dementia. This study evaluated the effects of therapeutic cooking activities and discusses the powerful meaning of food and cooking to older adults, making cooking activities an effective way to reduce the undesired emotional and behavioral side effects of Alzheimer’s disease. Being in a supportive environment and having positive personal interactions are among external factors that can contribute to “pleasant dementia.” As this article explains, there are usually a few things that have heavily influenced an individual’s life, and caregivers who are able to create connections between today and these pleasant, passion-inducing topics contribute to feelings of joy and excitement. For some people with Alzheimer’s, activities such as cooking a holiday meal evoke such pleasant emotions. There’s a clear link between negative emotions and unhealthy eating. While this resource doesn’t specifically examine these effects in people who suffer from Alzheimer’s, rather people in general, it’s worth noting that an unhealthy diet can have a negative impact on emotions – all the more reason to help to ensure your loved ones and care recipients are consuming a healthy diet rich in vitamins and nutrients. Cooking offers many benefits for people who suffer from Alzheimer’s disease, yet it can also be a dangerous activity if the person experiences certain symptoms of the disease and participates in cooking activities without proper supervision and preparation. The following resources offer guidance on creating a safe atmosphere for people with Alzheimer’s disease to enjoy the experience of cooking and baking. Even if a person with Alzheimer’s disease has difficulty with the more involved aspects of cooking a meal, there are plenty of simple ways to get them involved with activities in the kitchen. This article lists a multitude of cooking-related activities, such as setting the table, emptying the dishwasher, making simple recipes such as Jell-o or pudding, and other ideas. Sometimes, repetitive and consistent activities related to cooking are soothing – and easier for a person with Alzheimer’s to manage. This article describes putting a person with Alzheimer’s disease in charge of activities such as sorting, measuring, adding, and mixing ingredients. This strategy also leaves the riskier tasks, such as operating the stove, to a caregiver. Keep the work area safe and well-lit. Participating in activities they once enjoyed can play an important role in reducing irritation and aggression among people suffering from Alzheimer’s disease. As a caregiver, your role is to support these activities and make the environment as safe as possible. That means simplifying steps, providing a well-lit working area, and removing obvious hazards such as sharp knives and hot burners. As this resource points out, having an alternate activity planned is a good idea should the initial plan prove too frustrating. For instance, if the person with Alzheimer’s disease struggles with a complex recipe, have a simpler recipe or task planned so that they can still participate in the meal preparation process. Simple cooking tasks, such as whipping a batch of instant potatoes, shucking corn, or peeling apples are often easier for people with early or middle-stage Alzheimer’s who have difficulty with more complex recipes. Participating in the hustle and bustle of cooking in the kitchen, even if they’re not in charge of preparing the entire meal, can bring a sense of familiar comfort to those suffering from Alzheimer’s disease who once prided themselves on their culinary skills. Even activities directors for senior living communities offer cooking classes for residents with Alzheimer’s disease. Activities such as cutting up different types of fruit to make a fruit salad or hosting a bar-be-que with a countertop grill (of the George Foreman variety or something similar) can create a fun and inviting atmosphere enjoyable for all. Aside from hot dogs, countertop grills can be used for chicken breasts, quesadillas, or even grilled cheese sandwiches. Caregivers can do the same in their own homes – there’s nothing like a grilled cheese sandwich to bring feelings of childhood nostalgia. 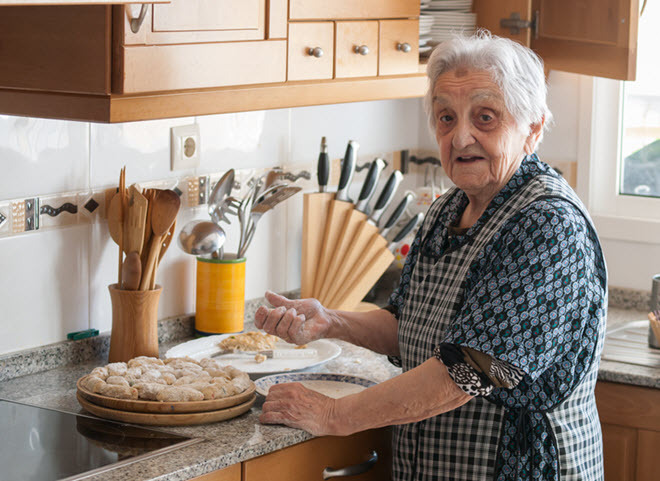 There are many ways to get a person with Alzheimer’s disease involved in household cooking and baking activities, allowing caregivers to make adjustments based on the progression of the disease and the severity of symptoms and effects from day to day. Sometimes, people with Alzheimer’s disease are more functional in the morning hours, while others function better in the evenings, for instance. This resource lists a variety of ways a person with Alzheimer’s can participate in cooking, including determining what ingredients are needed to prepare a dish, making a dish, measuring, mixing, and pouring ingredients, explaining to another person how the recipe is made, tasting food, or even simply watching others prepare a meal. Distractibility, forgetfulness, and difficulty following directions are a few symptoms that people with Alzheimer’s disease often experience. These symptoms can make unsupervised cooking dangerous, leading to fires, burns, or other injuries. 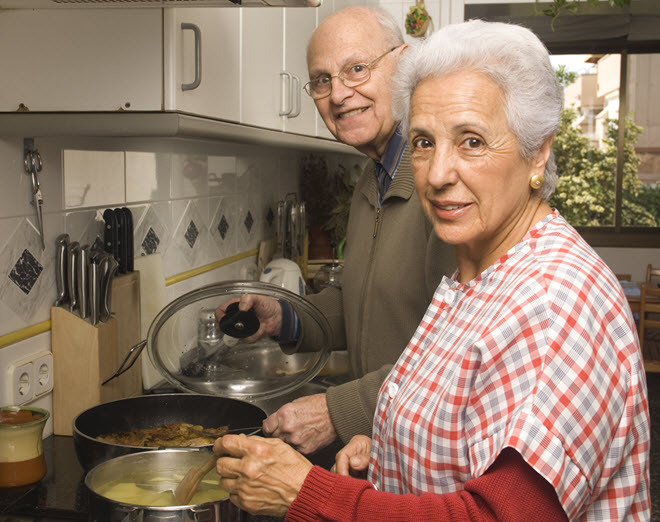 But with caregiver support and precautions, cooking can continue to be an enjoyable activity. “Remaining active, engaged and socialized has been shown to slow the progression of the disease and help the person cope with and adjust to changes in the brain. For all these reasons, planning their loved one’s day is as important for family as is managing medical care,” according to CaringNews.com. This article suggests that it’s beneficial to allow people with Alzheimer’s disease to continue participating in daily activities that they have always enjoyed. Caregivers can help by simplifying complex tasks, such as preparing and measuring ingredients ahead of time, having utensils readily available, and being available to offer guidance and support during cooking activities are helpful modifications. Unfortunately, Alzheimer’s disease often brings with it several challenges related to eating and nutrition. A change in the senses of taste and smell, for instance, can make certain foods seem less appetizing. Likewise, other challenges, such as difficulty using utensils or swallowing and chewing problems can lead to eating challenges. The following resources offer information on the eating-related challenges that may arise and provide tips for coping. For people with Alzheimer’s disease, getting regular, nutritious meals can become a challenge with the progression of the disease. As cognitive function declines, problems such as feeling overwhelmed by too many food choices and difficulty using utensils can make eating a less-than-enjoyable activity. This resource offers a number of tips for overcoming these common eating challenges, such as serving only one or two foods at a time and keeping place settings simple. People with Alzheimer’s may experience changes in their sense of taste and smell. This article shares the story of Paula Wolfert, who spent many years mastering cooking, and how she has simplified cooking and eating after her diagnosis, as well as how she cooks alongside her caregiving partner most days.This article from the Wall Street Journal also shares Paula’s story, noting how she focuses on eating brain-healthy foods following her diagnosis. Sticking to the basics, avoiding processed foods, focusing on the produce aisle, and emphasizing a variety of foods to ensure that a person with Alzheimer’s is getting the right nutrients are tips often offered by nutritionists and dieticians. This article offers advice from nutritionist Alyson Hendershot on proper diet and nutrition, as well as cooking tips, for people with Alzheimer’s disease. Try to stick to consistent meal times each day and create a quiet eating area by turning off the television and removing other distractions. This resource offers a number of tips to make meal time easier for people with Alzheimer’s disease. Caregivers must be able to pick up on various clues that signal problems with eating or nutrition among people with Alzheimer’s disease. This resource explains the challenges that can arise for Alzheimer’s patients, including refusal to eat, rejection of food, being too distracted during meal times, being unable to use utensils properly, and difficulties chewing or swallowing. Eating-related challenges can arise from a number of factors, such as environmental issues, behavioral and psychological issues, or even problems with the food or menu itself. This resource is a helpful guide for caregivers, offering tips for assessing eating challenges and working around them to ensure proper nutrition. One of the primary concerns for Alzheimer’s caregivers is ensuring the safety of their loved one, but this doesn’t have to mean excluding beloved activities, especially cooking. By implementing the advice in this guide, creating family meals can be a safe and beneficial way for caregivers to share some quality time, as well as delicious recipes, with their beloved friend or family member. And. Then to stimulate them to an activity is sometimes challenging.Nutrition suggestions and intetactive cooking is awesome! This looks like a fantastic resource and I’d love to receive a copy for professional resource as an occupational therapist who works with seniors with cognitive impairment at Royal Jubilee Hospital Memorial Pavilion, Seniors Outpatient Clinic, 1952 Bay Street, Victoria, BC Canada V8R 1J8. This would also be great to use for my own life as a daughter with a mom who no longer cooks due to the same condition. Recently read the article about Paula Wolfert in Cooking Light so was delighted to find this when searching for tips on cooking with dementia. Thanks!